Ipoh is a small little heritage town in the Perak state of Malaysia. From being an insignificant fishing village to a prosperous tin mining town, and changing hands from British to Japanese to British again, it has a checkered past which is alive in the form of architecture and food. During its mining heydays, it saw a massive influx of Chinese settlers who became the major contributors in shaping its culture. Owing to its rich past the government of Malaysia has given it the heritage status, and it is currently one of the most visited places in the country. If you are looking to escape routine life, it makes a great weekend getaway. Ipoh is also known for its food where some of the famous food have originated here. Here is the list of my favourite food in Ipoh which I managed to try during my very short trip. You can’t miss this one. 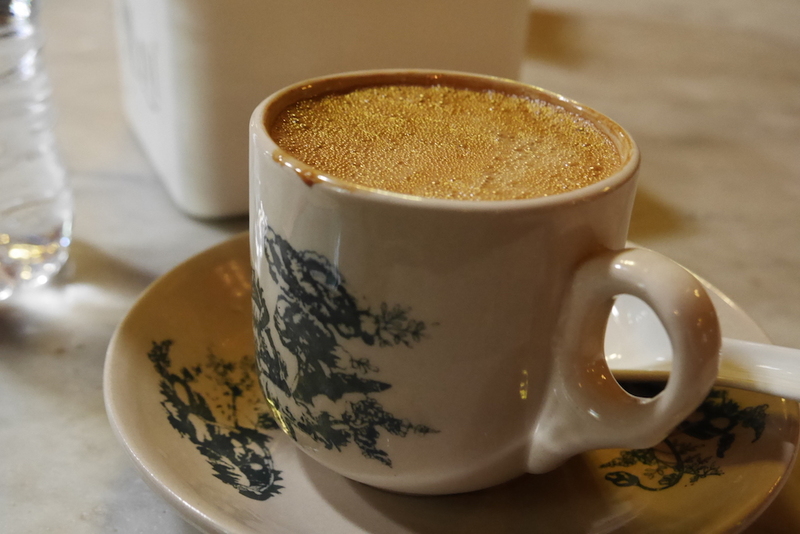 One main reason for coffee lovers (or should I say Kopi fanatics) to visit Ipoh is to try the white coffee straight from its origin. Yes, you can have Kopi Putih (as called in Melayu) at the very first branch of Old Town White Coffee. 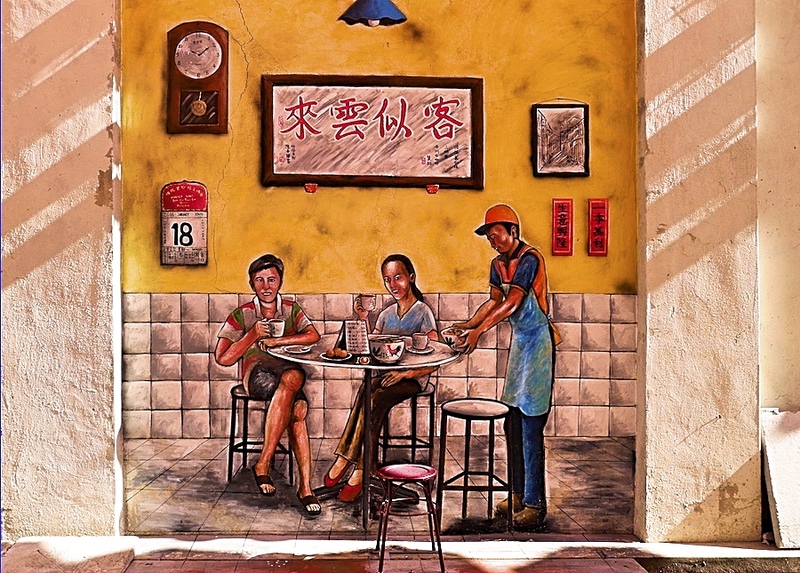 The coffee culture is the life of Ipoh; so much so that it is taken from the streets to its walls. If you are wondering what the hell is white coffee now, then it is made from the same coffee beans but roasted for a shorter period which gives it the lighter colour, and that’s how it got its name. I do recommend to try the white coffee at the Antique Kopitiam in Gopeng which is around 30 mins drive south from Ipoh. Also known as Tau Fu Fah. I had seen this dessert in Taiwanese shops but never had its texture appealed me. When I heard about Funny Mountain Beancurd in Ipoh which is a traditional shop that makes just beancurd, I had to try it. One important thing to note about this kiosk is, it opens at 10.30 am and closes until it runs out of the beancurd, which is very soon. So, you got to rush to try this one. 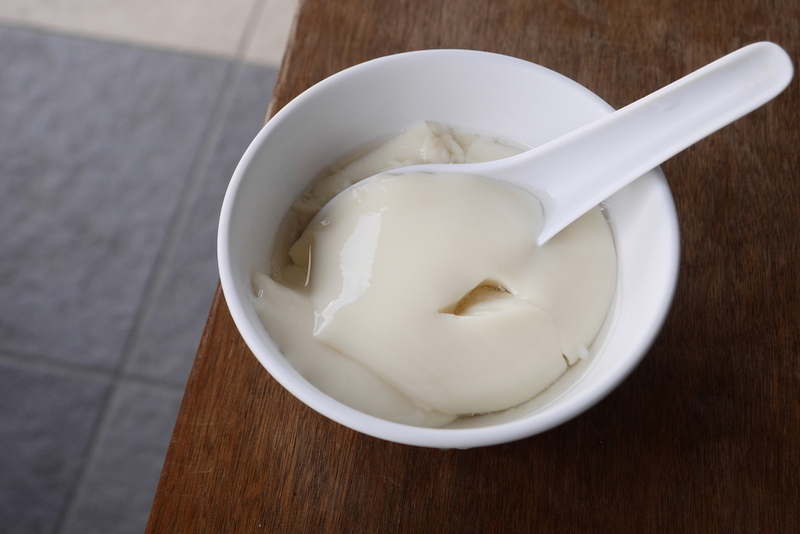 Beancurd is coagulated soy milk. At Funny Mountain they prepare it fresh every day and serve it with slight sugary syrup. You can easily swallow down 2-3 bowls of this warm and smooth dessert. The sad part is I suffer from sugar tooth, but the good part is Chinese desserts are not too saccharine, unlike the Indian ones. You can have them pretty much any time of the day; I had caramel custard for breakfast! 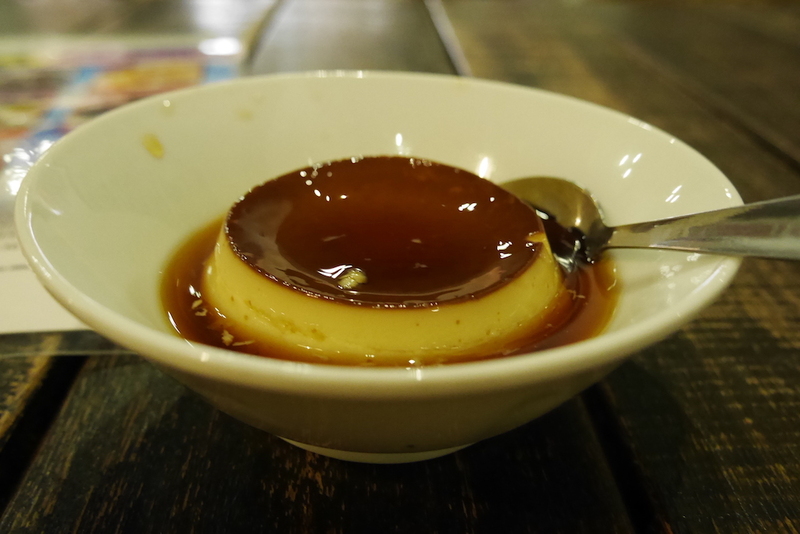 Supposedly, Thean Chun coffee house in old Ipoh serves the best caramel custard. When the serving lady asked me if I’d like to try their world famous caramel custard, how could I say no, plus, it was not bad at all. It is another well-liked dish at Thean Chun coffee house. It’s a Hakka dish that Chinese immigrants brought to Ipoh. A great breakfast dish with slithery rice noodles dipped in sweet and spicy sauce. I omitted the option of shrimp filling as don’t like the idea of eating seafood first thing in the morning. I preferred eating this over Kai See Hor Fun – first because, there was still some time before they started serving Kai See Hor Fun, second, I was told it’s a big bowl, I will not be able to finish it alone, don’t waste money! So, then I had no choice. It is a traditional Chinese pastry which is available both in Malaysia and Singapore, but it is only in Ipoh where they find their status of souvenirs. 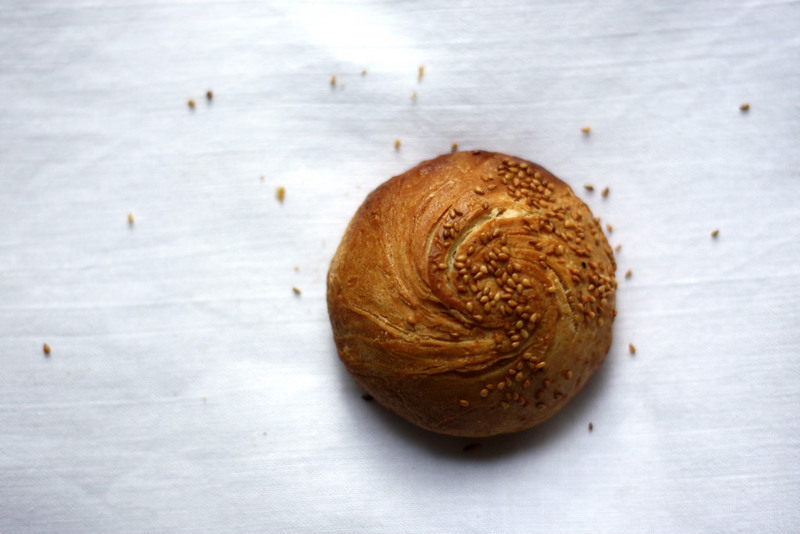 It has flaky crust outside and sweet sticky filling inside. You will see many confectionaries selling these, not sure if there’s any real difference in taste. These deserve a try as they are a speciality in Ipoh. There were various other things which I had on my list, but I didn’t want to kill myself with non-stop eating. But do share your favourite food from other towns of Malaysia. I believe food is something which forms an important part of travel and without it, your experience is only half felt. Normally I\'m against killing but this article sltrahgeued my ignorance. Damn! too tempting! Excellent photography.